A new year brings new promise, as well as new challenges. 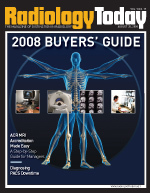 Here are five topics from RSNA 2008 that are likely to get your attention in ‘09. 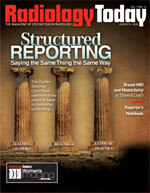 If you weren’t at RSNA, you may have missed these interesting reports. Wondering where you are on the salary spectrum? Find out what your peers told us about technologist compensation. Check out some of the latest wares from the biggest medical show of the year. 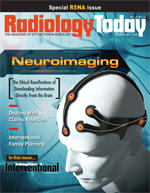 Read about the latest happenings in radiology, including how hi-res CT can detect impaired bone development related to anorexia and a study that finds small colon polyp removal to be costly and unnecessary. To Call or Not to Call — How High Is the Standard? If it were possible to read someone’s mind, would that information be admissible in court? The increasing capability of functional MRI to track brain activity is raising some serious privacy questions. No one likes to be rejected, especially when it comes to medical billing. With the right plan, you can significantly reduce your billing denials. Ultrasound technology has been growing at a rapid pace since the late 1960s, but its history stretches back much farther than that. An interventional procedure offers a minimally invasive method of permanent birth control. What should radiologists be worried about? We asked Cynthia S. Sherry, MD, FACR, the new president of the American College of Physician Executives. SPECT Study Finds Brain Abnormalities Associated With Fibromyalgia; 3D CT Leads to More Successful Varicose Vein Treatment in Lower Extremities; and more. RBMs — The Wrong Tool? 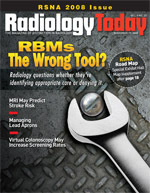 Radiology benefits management companies are increasingly being used by insurers to weed out unnecessary imaging orders, but are they focusing too much on the financial side of the equation? Doctors lament that too many people forego colonoscopy screenings. Now that CT colonoscopy technology is maturing, will more people get screened? A new MR procedure shows promise for identifying the composition of atherosclerotic plaques, which may lead to better stroke prevention. Tracking lead aprons can be time consuming and tedious, but new software helps make the task less of a burden. While you’re in town for RSNA, sample some of the city’s fine cuisine. RBM: Radiology Benefits Management or Rather Bad Medicine? Dynamic Volume CT: A Macroevolution? New techniques for imaging and radiation therapy show potential benefits. 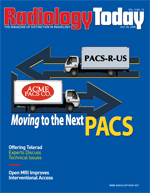 Specialty physician groups are finding that the benefits of PACS extend far beyond the radiology department. Cardiac MRI offers a wealth of data, but do the obstacles in its path outweigh potential benefits? Several studies show that PET is useful for cancer treatment planning, and clinicians are hoping to get the Centers for Medicare & Medicaid Services to approve its broader use. With the biggest medical show of the year right around the corner, it’s time for a peek at what’s new. Increasing demand for radiologist subspecialization is driving growth in the teleradiology market. The expanded use of MRI has raised concerns about proper infection control, particularly as it relates to methicillin-resistant Staphylococcus aureus. There was plenty of news from the 50th annual meeting of the American Society for Therapeutic Radiology and Oncology last month. Medical facilities need to be aware that Health and Human Services is taking a closer look at HIPAA-related privacy issues. RT spoke with MRI expert Kanal about the possible causes of and necessary precautions for nephrogenic systemic fibrosis. When Is a New Product a Product? It takes more than a good idea to get a new clinical product on the market. While some clinicians believe that breast MRI should only be used in limited cases, others believe it should be used more. Revenue cycle analytics software is helping to maximize healthcare organizations’ profitability by automating and simplifying financial management activities. Which Comes First: the Job or the Tool? The CMS is not conducting unannounced HIPAA audits, but appears to be ramping up compliance enforcement. Make sure your facility has a security plan in place before you get a call. Do you know what your legal liability is regarding communicating urgent findings? You may be surprised by how far your obligation reaches. There’s a lot of new research being done with molecular imaging. Have a look at some of the work that was presented at the Society of Nuclear Medicine’s annual meeting. If there’s something you need for your facility, you can probably find it here. Are You Who Your Brain Chemistry Says You Are? A recent paper assesses the economic cost of new oncologic interventions. Radiology Today Book Excerpt: Looking Within: Imaging the Body, Exploring the Human Spirit Take a peek at a day in the life of radiologist Cullen Ruff, MD. Researchers hope that the combination of PET and Pittsburgh Compund-B may eventually detect slight amyloid brain deposits and provide enough lead time to prevent Alzheimer’s disease. Applying for MRI accreditation only seems as difficult as deciphering the Mycenaean Linear B tablets. By following some practical tips, it doesn’t have to be Greek to you. Whether planned or unplanned, downtime is never a good time. Find out what you can do to minimize headaches and maximize productivity. In the current economic and political climate, medical imaging is facing increased scrutiny. For this reason, it’s more important than ever to quantify the value it adds to the healthcare system. Biopsies are an unpleasant necessity in breast cancer care, but advances in imaging may allow clinicians to characterize breast lesions with less reliance on standard needle procedures. 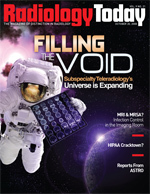 Don’t miss our annual directory of the latest in imaging products and services. 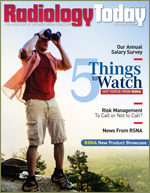 Participate in our annual salary survey for technologists and administrators. A kidney stone by any other name would be just as painful, but unified terminology for describing radiological images may reduce the pain of communicating findings among multiple audiences. Couldn’t make it to the Society of Nuclear Medicine’s 55th annual meeting? Here’s a look at some of the latest research. Breast MRI and Mastectomy — Is There a Link? Breast MRI has become a valuable adjunct to mammography, but are more women deciding to have mastectomies based on MRI findings? When it comes to interventional procedures, 1T open MRI offers some significant advantages. You’ve decided to upgrade your PACS, so now what? Here are some key considerations to guide your implementation. While you’re shopping for sunscreen and beach towels during these warm months, you might want to consider a new RIS or MRI shield to get your practice ready for the autumn rush. The growing demand for imaging services is making teleradiology less of a luxury and more of a necessity, but there are several issues that need to be addressed before a facility takes the plunge. PACS and RIS implementation helped a community medical center scale its services. A new study finds that sonography can effectively distinguish malignant from benign thyroid nodules. For many reasons, radiologists are in short supply, which means competition for services is going up. An interventional procedure may aid pancreatic cancer survival. Roland Talanow, MD, PhD, is a busy man. In addition to completing his radiology residency, he’s developed several Web-based tools for radiologists. Calcium scoring helps clinicians determine intermediate risk of coronary artery disease, but calcium coverage scoring may have a lower assessment handicap. Gamma cameras have been around for a while, but using two adds depth to the modality’s breast imaging contribution. New guidelines for report turnaround times from the Medical Transcription Industry Association and the American Health Information Management Association place radiology at the top of the list. If you’re in the market for a PACS, we’ve got plenty of possibilities for you. After OsiriX offered physicians a taste of a DICOM viewer on a Mac platform, it was only a matter of time before they started lining up for a bite. There are numerous treatments for uterine fibroids but, frequently, women only hear about hysterectomy. That’s a situation many interventional radiologists are hoping to change. How’s your dictation? Even if you think it’s good, it could probably be improved. By following a few simple guidelines, you can shave time and money off your transcription costs. 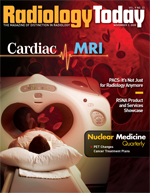 Find out what the head of cardiac radiology for NightHawk Radiology Services thinks about the state of the specialty and where off-site reading is headed. Radiologist assistants are in demand for good reasons. Find out how these professionals contribute to a radiology practice. Here are a few things to keep in mind when auditing your coding processes to facilitate compliance with CMS rules and improve receivables. 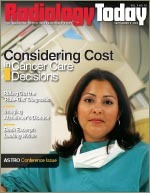 Studies have shown that computer-aided detection can enhance mammography, and the first CAD/CR mammography solution is set to hit the market. Even if you weren’t able to attend the 108th annual meeting of the American Roentgen Ray Society, you can still catch up on some of the research that was presented. An investigational ultrasound system captures 2,000 to 5,000 images of breast tissue and links them together in a “moving loop” of streaming video. Its inventor hopes it will do for breast cancer what Pap smears did for cervical cancer. 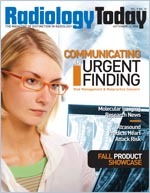 It can be a challenge to link marketing initiatives to referral increases, but one radiology group has found that the effort has strengthened their practice. 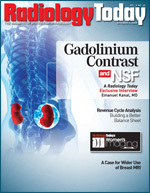 Read about some of the latest in cancer diagnoses, molecular imaging, and company news. Getting rid of medical records isn’t as easy as dropping them in a trash can. Find out what you need to know to properly dispose of medical information and cover your assets. Data from the National Oncologic PET Registry suggest that PET is an effective tool for diagnosing and observing all cancers. Will the Centers for Medicare & Medicaid Services agree? A Texas radiologist has a novel view of pro football—as a team owner. A new study shows that uterine artery embolization is a good choice for many uterine fibroid patients, and interventional radiologists are working to spread the word. Older women benefit from mammograms and radiation therapy. Do you need a new phantom or some biopsy equipment? How about a CD burner? Whatever you need, check out some of the latest products in our showcase. In-room and onboard imaging allow oncologists to guide radiation treatment with near–real-time images rather than ones that are days or weeks old. Is dose-guided radiation therapy far behind? There were plenty of new studies presented at the Society of Interventional Radiology’s annual meeting, and here are a few that got our attention. For regional health information organizations and health information exchanges, the ultimate question is whether they can become sustainable. Effective planning can determine the answer. New techniques allow clinicians to target lung tumors with higher doses of radiation than ever before with less damage to surrounding tissue and fewer side effects. Catch up on the latest news from the Society of Interventional Radiology’s annual meeting. A groundbreaking, multisite study offers insight about how to best evaluate lung nodules. When it comes to cutting radiology report turnaround times, speech recognition technology helps whether a facility uses it on the front or back end. Reducing the time between diagnosis and treatment generally results in better patient care, and new ultrasound techniques may help clinicians shorten that gap—possibly even allowing biopsies to be performed in real time. If nationwide digital health information systems are going to gain traction, they’ll require unique patient identifiers, and voluntary ones may help the rubber meet the road. The proliferation of medical data can present challenges to medical facilities, especially in the areas of transfer and protection. Reducing the use of paper can provide time and cost savings—as long as the digital solution allows access to data when and where they are needed. Early stroke treatment is crucial for minimizing brain damage, and early intervention with intra-arterial therapy offers hope for better outcomes. Peripheral artery disease is commonly treated with stents, but new self-expanding stents add flexibility to the procedure. New breast ultrasound technology offers larger, consistent 3D views of breast tissue, and clinicians who have used it like what they’ve seen. With the ever-increasing use of CT scans fueling concerns about radiation exposure, manufacturers are introducing CT features that reduce the dose. Contrast is an important imaging tool, but not everyone needs the same amount of it. A new method of computing the dose allows for customization and potentially improves image quality while lowering cost and patient risk. Privacy concerns get the most press, but there is another danger posed by personal health records—lack of use. While the debate about who should control access to health records continues, patient rights advocates, healthcare providers, and technology vendors are working to find common ground. As IT continues to connect disparate healthcare segments, the Integrating the Healthcare Enterprise initiative keeps stirring the interoperability pot. With an ever-increasing emphasis on speed and user friendliness, structured reporting is helping create faster, clearer radiology reports. An old process with a new twist is helping radiologists to see breast lesions in 3D, and the possibility of improving accuracy while reducing false positives looks promising. As more mammography centers convert to full-field digital mammography, the CR vs. DR debate intensifies. For one multisite mammography group, CR offered much-needed flexibility without sacrificing image quality. A new study touts the potential benefits of CT scans as adjuncts to autopsies, but there are some barriers to getting the technology into medical examiners’ offices. Although they faced initial concerns, facilities that adopted speech recognition technology have seen dramatic gains in productivity, along with substantial cost savings. While MRI with contrast is still considered the gold standard, researchers are using arterial spin labeling to magnetize the water in blood cells and turn them into a patient’s personal contrast agent. A new study using this technique reported some interesting news about Alzheimer’s and high blood pressure. Inflammatory breast cancer is much more aggressive than other breast malignancies. Clinicians are hoping that earlier diagnosis with FDG-PET/CT will allow them to begin aggressive treatment sooner. An inexpensive, minimally invasive procedure offers potential relief to the many who suffer from calcific tendonitis of the shoulder. The early signs of Alzheimer’s are similar to other forms of age-related dementia. PET scanning is proving helpful in differentiating one disease from another.